You know Corgan isn’t just going to play a greatest hits set and that’s to his credit, for a formidable catalog of deep cuts the Smashing Pumpkins have. It was a beautiful night in the summer of 2015, but the harmonic convergences taking place had some feeling like it could have been the mid-’90s. 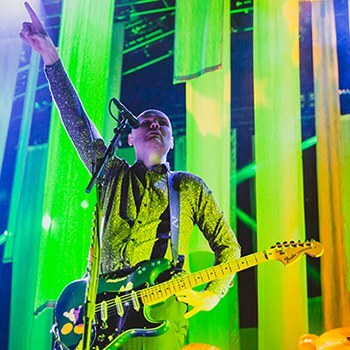 Both the Smashing Pumpkins and Veruca Salt were launching summer tours in the Golden State during the week, lending 2015 an appealing retro vibe harkening back to the alt-rock glory days of the late 20th century. Smashing Pumpkins bandleader Billy Corgan even had old pal Jimmy Chamberlin back in the mix on drums, leading to a renewed anticipation for the sonic power of the Pumpkins in their prime. The mercurial Corgan may not have made all the right moves over the years, but he always seems to make up for any missteps. Breaking up the Pumpkins in 2000 was an extremely disappointing move. But putting the band back together in 2007 even with only 50 percent of the original lineup was a great move for rock ‘n’ roll, as was mending fences to get Chamberlin back on board this year. Co-headliner Marilyn Manson probably helped sell some of the tickets, but the audience vibe during Manson’s opening set indicated that the majority of attendees were on hand to see the Smashing Pumpkins. Manson’s shock rock vibe comes across fairly gimmicky at times and his catalog certainly lacks the depth of the Pumpkins’ repertoire. But Manson did rouse the crowd a bit when he came out on stilts during an industrial cover of the Eurythmics “Sweet Dreams”, as well as when he sang from a makeshift pulpit during Depeche Mode’s “Personal Jesus". Manson did achieve some genuine alt-rock vibes on “Kaboom Kaboom", where he sang of not trusting anyone sober and his lead guitarist delivered some actual rock riffage. But there was no question the bands were playing in the right order. The energy soared from the moment the Pumpkins hit the stage with “Cherub Rock", their breakthrough rocker from 1993. Seeing Chamberlin drumming up a storm behind Corgan again was a glorious sight to behold and it seems the music gods have a genuine taste for classic grunge here in 2015. “We're thrilled Jimmy's back in the saddle this summer to drive a super high-octane set, and it's nice to see the stars aligning around Smashing Pumpkins anew,” said Corgan in a press release announcing the End Times Tour with Manson. Fans were thrilled as well and a high-octane set it was with “Cherub Rock” followed by “Bullet With Butterfly Wings” and the majestic “Tonight Tonight". There was a bit of cognitive dissonance in seeing the Pumpkins without a female bassist and it’s too bad neither Ginger Reyes or Nicole Fiorentino was available, as they both performed superbly over the past eight years. But new bassist Jack Bates was rock solid and the results would be truly felt in some of the show’s deep cuts. You know Corgan isn’t just going to play a greatest hits set and that’s to his credit, for a formidable catalog of deep cuts the Smashing Pumpkins have. “Ava Adore” shifted gears a bit with a more industrial sound, but with Corgan still providing those ever cathartic vocals in his classic uplifting style. Guitarist Jeff Schroeder, a Pumpkin since 2007, also stepped up here to shred a molten hot solo that left no doubt he’s the right man for the gig. “The more I talk the worse things get, so we’re just gonna play music,” Corgan said tongue in cheek before dedicating “Drum + Fife” from 2014’s Monuments to an Elegy to the nation’s military vets. The set really ignited with the next song, that same album’s “One and All” during which the band gelled with a rock power that surged into “Everlasting Gaze” and fueled the rest of the set. The band tore through the seminal “Zero” with an incendiary fury fitting of one of the great alt-rock anthems of the ‘90s and it’s only too bad the song always ends so quickly, because it’s primed for a deep jam. Time almost seemed to stand still when the band launched into “Mayonaise”, a sparkling fan favorite from Siamese Dream that’s become quite the rarity. The opening notes felt like the first rain drops after a long drought before the huge chords of the first verse crashed in to create a wall of sound akin to a cleansing storm. It was here that Corgan finally stepped out with a deep guitar solo of his own, after being content to leave most of the lead work to Schroeder while he focused on the grooves with Chamberlin. “I just want to be me, when I can, I will,” sang many in the crowd in a cathartic singalong with Corgan in one of 2015’s peak concert moments. Corgan continued to show his softer side with his heartfelt cover of Stevie Nicks’ “Landslide", arranged in crowd pleasing acoustic duo format with Schroeder. Corgan’s version is one of those rare covers that takes on a life of its own next to the original, ultimate homage to the quality of Nicks’ timeless classic. “1979” kicked the show back into rock mode, igniting a dance party across Irvine Meadows. The only real misfire of the night followed with “Run2Me", the third tune from Elegy and the first to fall short. The song just fell flat, deflating the rocking vibe from “1979” as many in the crowd took their seats for a break. Why no songs from 2012’s Oceania were played is a mystery, particularly since Corgan felt the album was strong enough to play in its entirety for an whole tour. Majestic rockers like “The Chimera” and “Inkless” certainly don’t deserve to gather dust, but such is life in the catalog from one of Generation X’s most prolific songwriters. The band rebounded triumphantly with “Thru the Eyes of Ruby” though, as Corgan and company delivered one of the most blistering performances of the year in live music. The epic track showed the band at the height of their majestic power as the song evolved from its shimmery underwater intro to the full sonic fury that has been so often imitated but so rarely replicated over the past two decades. “Stand Inside Your Love” kept things rocking nicely with a major key twist, showing off the Pumpkins’ multi-dimensional ability to shift between minor and major keys, something more bands would do well to learn. The band’s full sonic power was on display again with set closer “United States", the powerful centerpiece of 2007’s Zeitgeist album that featured a sinking Statue of Liberty on the cover. The epic tune is a drumming clinic for Chamberlin and a guitar master class by Corgan and Schroeder where they blend Black Sabbath with Led Zeppelin, Jimi Hendrix and ‘80s metal with dynamic results. The song included a raging jam where the band was just flat out killing it, complete with a psychedelic instrumental interlude on “The Star Spangled Banner” that delivered the same type of thematic statement Hendrix was going for at Woodstock. Each reverby note seemed like a cry for freedom in these precarious times where society’s descent into the Orwellian nightmare feels all too near, hence Corgan singing “tonight I want to fight a revolution” when the song kicked back in. The triumphant set received a big cherry on top when the band encored with “Geek USA", another mainstay track from Siamese Dream that’s been all too rare in recent years. There just aren’t many bands in rock history that can crush it like this, mixing psychedelic hard rock with infectious riffs, melodic vocals and face melting guitar solos to boot. It’s a relatively unique sonic formula and it’s what makes the Smashing Pumpkins one of the most influential bands in rock history. Fans can only hope that this summer tour leads to a fall headlining tour where the Pumpkins expand their set to a full two and half or even three hours, as they did during their stupendous residency at San Francisco’s Fillmore Auditorium in 2007. Corgan has more killer tunes sitting on the shelf than most bands can write in a lifetime and it would be another slice of rock ‘n’ roll heaven to see some more of those gems dusted off than 90 minutes can allow.